It’ll be here before you know it. May 3 is the application deadline for UC’s 2019 Sautter Awards for Innovation in Information Technology. To apply, read the program description, listen to a recording about how to write a winning Sautter application, and submit a Word document or PDF (there’s no form!) by email to Yvonne Tevis to tell the selection committee why you should win. This annual award program is sponsored by the UC IT Leadership Council (ITLC). 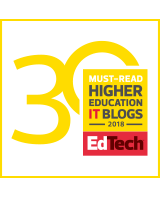 The awards recognize technology projects that demonstrate ITLC priorities, including innovation, collaboration, and operational efficiency, and that advance UC’s teaching, research, health care, and public service missions. The program is open to faculty and staff from all UC campuses and medical centers, the Office of the President, Hastings College of the Law, and Lawrence Berkeley National Laboratory. Teams or individuals who have implemented an innovative IT project at UC in the last three years are encouraged to submit an application for an award. The full gamut of IT projects may be submitted for awards. Award-winning projects in 2018 included a toolkit of customizable resources available to all UC campuses for raising cyber security awareness; a campuswide movement for continuous improvement and business excellence using Lean Six Sigma; and a publicly accessible database providing the boundaries of grape-growing regions, or American Viticultural Areas. Review the prior awards and applications to get a sense of the range of projects submitted. The Sautter Award Program presents up to three Golden Awards, two Silver Awards and five honorable mentions. Award recipients will be announced at the UCTech Conference, July 15 – 17, 2019, at UC Santa Barbara.